Manufacturer of a wide range of products which include road stud, abs road studs, reflective road studs, solar road studs, safety reflectors and plastic road studs. 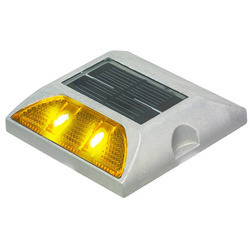 Featuring use of quality solar power based LEDs, these Road Stud are virtually maintenance free and find extensive use in demarcating center of roads as well as road edges. Featuring use of ABC Cat’s Eye, these road studs are available in sizes of 90x110x17 mm. Further, for durable usage, the studs are constructed using flexible and UV protected material which makes these long lasting in usage. Some of the advantages of these road studs include helping in reducing road accidents by working as warning to drivers, work as effective night guidance device in adverse weather conditions, featuring advanced and extensive research based designs which adds to their superior visibility and others. Our expertise also lies in offering these in other sizes as per the specifications provided by the customers. 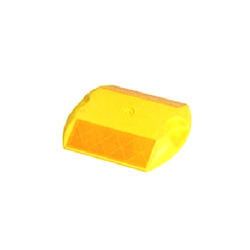 Developed using high impact polymers, these ABS Road Studs are available in size of 81x116x17 mm in ABS plastic as well as aluminum construction finish as per the specific requirements of the clients. Further, the use of superior grade material also makes these studs last long as well as better adjusted in bearing impact of vehicle crossover. Other than this, the use of quality reflective panel in studs also offers optimum reflectivity support even in poor weather conditions. Some of the standard advantages of these studs include UV stabilized and special material composition to assure of superior impact strength, provide for effective night guidance support, capability to handle sever vehicle impacts, high reflectivity support among others. 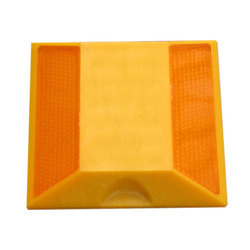 Available in aluminum alloy body in size of 110x128x30 mm, these Reflective Road Studs find use in applications like edge road marking , marking of road diversions, marking zebra crossings , parking zones, center lanes, speed breakers and others. Suitable for permanent or temporary installation, these road studs can be offered in both depressible/non depressible options as well as with protective coating support if desired by the customers. Meeting the demands of superior road safety as well as optimum visibility even during poor driving conditions, these road studs can also be used in pathways for guidance of pedestrians. Some of the other advantages of these road studs include coming in standard colors, use of long lasting marking paint for high visibility, available in long lasting construction finish and others. Solar Road Studs are widely used on roads, highways and parking areas for providing an easy guidance to the peoples in all weather conditions. 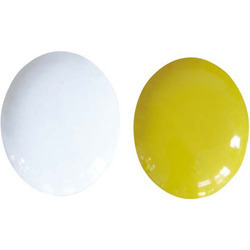 We are offering our range in different colors as per the client's specific requirement. The life span of these Solar Road Studs is very long more than 3 years. Due to the high visibility of these Solar Road Studs the risk of accidents can be avoided. 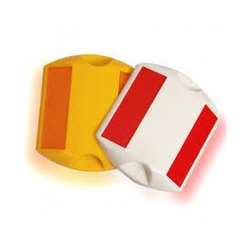 Safety Reflector is a retro reflector intended for pedestrians, runners, motorized and non-motorized vehicles. This one is similar to reflective stripes that can be found on safety vests and clothing worn by road workers and rescue workers. They are sometimes erroneously called luminous badges or luminous tags, but this is incorrect as they do not themselves produce light, but only reflect it. 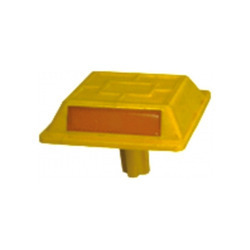 These Plastic Road Studs are extensively used as the guidance lights in airports, busy traffic intersections, foggy weather, sharp curved roads and fly overs. We have used innovative technology and virgin raw material in the manufacturing process to ensure flawless performance and durable quality standards. Clients can avail this range in varied configurations at the industry leading prices. Meeting the demands of superior road safety as well as optimum visibility even during poor driving conditions, these Road Studs can be used in pathways for guidance of pedestrians. Some of the other advantages of these studs include coming in standard colors, use of long lasting marking paint for high visibility, available in long lasting construction finish and others. Solar Studs are flashing solar cell powered LED maintenance-free lighting devices used in road construction to delineate road edges and centrelines. Embedded in the road surface, they are an electronic improvement on the traditional cat's eyes in that they may give drivers more than a thirty-second reaction window compared with about 3 seconds for conventional reflective devices.